Rediscover nature in the heart of the city. The urban layout of Olot is set around one of the most famous volcanoes: Montsacopa. What is also known as the Sant Francesc volcano reminds you that you are in volcano country and in a district where the landscape will surprise you with every step you take. Montsacopa is also a great vantage point. Only a few minutes’ gentle stroll from the centre, and you will be given some impressive views of the city. The spectacular pits on Montsacopa volcano, old areas where volcanic lapilli was mined, show the inside of the volcano and the materials indicate that the volcano formed several thousand years ago was caused by a relatively small eruption, in which a large part of the volcanic cone was formed by the splattering and falling of volcanic lapilli and bombs, followed by a very mild eruptive phase, in which a lava flow ran north-east, and then a very explosive eruptive phase that caused the round crater. 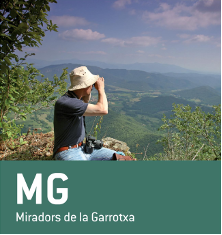 Walking around the volcanic cone, you will see different panoramic views of the neighbourhoods in Olot and other points of special interest, such as La Garrinada volcano, Aiguanegra mountains and the summits of the Puigsacalm, Bassegoda or La Mare de Déu del Mont. 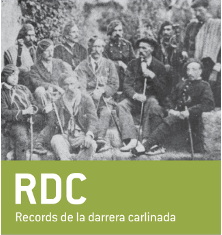 On your walk around Montsacopa, you will come to the hermitage of Sant Francesc, built at the end of the Peninsular War on the site of an old military building, and the watchtowers that were erected during the era of the Carline Wars. 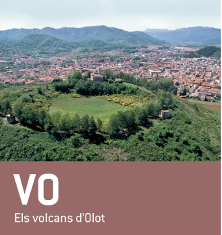 But Olot has even more volcanoes! If the visit to Montsacopa has awoken an interest in volcanoes, then we suggest you head for Montolivet volcano, following a signposted route through the city, up the volcano and back to the city centre along the Fluvià river. You can also visit Les Bisaroques volcano that is only a few minutes from the city centre. Parc Nou, an urban park with four hectares of greenery and elements of classic English landscape gardening, a botanical garden of local flora and a huge common oak forest, a garden of medicinal plants and the Museu dels Volcans (Volcano Museum) that will give you an insight into the volcanic phenomena, earthquakes and ecosystems of La Garrotxa. The La Moixina marshes, located near Parc Nou, are an area of wetlands with a wide variety of flora and fauna. People with mobility difficulties wishing to visit Montsacopa volcano by vehicle must request authorisation by e-mail at [email protected] several days in advance. More info: 972 26 01 41 (Olot Tourist Office).